Introduction: The way of living associated with "western culture" - a diet rich in saturated fats and calories, smoking and sedentary life - plays an important role in the recurrence of coronary events in patients with diagnosed coronary artery disease. In many people, this way of living leads to changes of biochemical and pathophysiological characteristics, which increases the development of atherosclerosis and thrombotic complications. Purpose: The purpose of this study was to investigate the effect of dietary and smoking habits in the health status of people who have suffered acute myocardial infarction. Material and Methods: The studied population consisted of 930 patients who had suffered acute myocardial infarction during the years 2000 to 2003. The research team used the records of hospitals for initial data collection. Four years after patientâs discharge from hospital, through telephone follow-up, completed a special questionnaire referring to disease progression. Results: The mean age of patients who have not suffered a new cardiovascular event (Group A) within 4 years was 64 ± 12 years. The population appeared a new cardiovascular event (Group B) had an average age of 65 ± 11 years and patients who died (Group C) had a mean age 67 ± 12 years. (p = 0.031). 77% of group A were married, so was 75% in group B and 88% in group C (p = 0.044). 90% of group A followed healthy dietary habits after hospital discharge, so did 78% of group B and 92% of group C (p = 0.001). Half pack (½) of cigarettes on average per day declared they smoked all three groups. Group A and B smoked the specific number of packets for 34±12 years in average while Group C for 41±14 years in average, (p =0.051). Conclusions: The rehabilitation programs in patients after acute myocardial infarction with frequent follow up have a significant role in improving the quality of life and reducing the risk of a new ischemic event. The way of living associated with "western culture" - a diet rich in saturated fats and calories, smoking and sedentary life - plays an important role in the recurrence of coronary events in patients with diagnosed coronary artery disease. For many people, this way of living leads to changes of biochemical and pathophysiological characteristics, which increases the development of atherosclerosis and thrombotic complications. It is scientifically evidenced that changing the way of living and reducing risk factors; in particularly smoking cessation and maintenance of healthy eating habits can reduce coronary heart disease emergence, both before and after the appearance of clinical events. The purpose of this study was to investigate the effect of dietary and smoking habits in the health status of people who have suffered acute myocardial infarction (AMI). This effect was evaluated four years after hospital discharge and depending on the evolution of their disease it was investigated if patients experienced or not a new episode of coronary heart disease or died. The study‟s population consisted of 930 patients who had suffered an acute myocardial infarction during the years 2000 – 2003 and were hospitalized in large state hospitals in Athens. Data collection was performed after studying the patients‟ files in hospital records and filling out a special questionnaire regarding the disease‟s development. Information was received via telephone monitoring by patients and their relatives, four years further to their hospital discharge. Each interview‟s duration was 15 to 30 minutes. The questionnaire‟s validity and reliability were checked ad hoc via its pilot administration to a sample equal to 5% of the expected total sample of the study (n=50) by two researchers, performed twice with each interviewee. A consensus of responses was noticed both among researchers and the interviewees themselves at a percentage that was not lower than 95% in each case. The study began in January 2004 and was completed in July 2007. Qualitative variables with more than two categories were converted to respective two-value variables, to facilitate the results‟ interpretation. Comparison via the quantitative variables of the sample per each of the three outcome categories was implemented using the one-way ANOVA method. All checking was bilateral on a statistic significance level of p<0.05. Statistic package SPSS v13.0 was used. From data descriptive analysis, it was found that 13.9% of patients were hospitalized in the Greek Red Cross hospital, 17.8% in the Athens General Hospital „Evangelismos‟, 23.3% in the Athens General Hospital „Ippokrateio‟, 40.3% in the Athens General Hospital of Chest Diseases „Sotiria‟ and 4.6% in the General Athens Hospital „G. Gennimatas‟. Regarding gender, 78.1% were male and 21.9% were female. Regarding residence, 66.3% of the sample studied were living in Athens and 33.7% of them were living in the district. The average age of patients was 64.8 years old and the standard deviation was 11.7 years. Regarding educational status, 52.7% of the sample studied had primary education, 19.1% secondary education and 28.2% had higher education. Regarding family status, 78% were married, 4.3% were single, 9.5% were divorced and 8.2% were widowers / widows. The average hospitalization duration was 10 ±4 days. On their admittance to the hospital, thrombolysis was performed on 54.2% of the participants, angioplasty on 28.2% and coronary artery bypass graft on 17.6%. Arrhythmias were reported after hospital release by 4.2% of the sample studied, cardiac failure by 1.1% and 4.2% of patients were subjected to placement of a permanent pacemaker. A new episode of coronary disease over the entire sample occurred in 20.1% of the sample and in particular, 26% of the sample had angina pectoris, 67.1% had a new infarction and 6.8% had a cerebrovascular stroke. 83.9% of the population was re-admitted to the hospital and treated with angioplasty by 43.6% and modification of the pharmacological treatment by 56.4%. Out of the entire sample, within the 4 years of follow-up, death was reported by relatives in a percentage of 14.1%. Examining the dietary habits of the study population after the cardiovascular episode, 88.3% stated that they followed a healthy diet, contrary to 11.7% who did not comply with medical orders. When asked if they follow the Mediterranean diet in particular, percentages differentiated, with positive responses by 75.4% and negative by 24.6% of the sample. For the correct evaluation of dietary habits in the current research, we used a special scale of dietary evaluation with value range from 0 to 12, where values over 10 suggest a healthy nutrition and values lower than 6 suggest that the person abstains from the suggested dietary habits. The average sample value in this scale was 8.02 with standard deviation ±2.276 measuring points. With regard to smoking habits, 61.7% stated that they were not smokers before the infarction, contrary to 38.3% who were. In particular, 21.2% of smokers stated smoking ½ packets of cigarettes on average per day, 7.9% 1 package, 5.5% 2 packets, 1.9% 3 packets and 1.8% 4 packets. They also stated that they have been smoking the aforementioned quantity of cigarettes for 35 ±12 years on average. From smokers, 65.1% quitted smoking after the infarction, and 34.9% continued smoking, 13 ±6 cigarettes a day on average. In the question regarding the doctor‟s or nurse‟s insistence on quitting smoking, which the patients were asked to valuate on a scale from 1 to 12, with 1 being very low and 12 being very high, the range of answers was evaluated at 11.5 ±1.1 of the scale. The patient‟s willingness to quit smoking, based on the same scale, reached 7.73 ±2.7. Regarding physical exercise, the answers provided were the following: 39.4% stated they often exercise, 34.3% stated sometimes and 26.3% never. The type of exercise preferred is: gym by 5.2% of the participants, combination of work and exercise by 10.9% and walking by 83.8%. Further to hospital release, 35.2% of the patients often visit a cardiologist, 17.9% visit a cardiologist some times and 46.9% never visit a cardiologist. 36.1% of the sample is subjected to laboratory examinations once a year, 31.4% twice a year, 12.9% once a month and 19.6% follow doctor‟s orders with regard to this issue. Increased blood pressure is stated by 53.2% of the sample, high cholesterol by 39%, diabetes mellitus by 20.8% and obesity by 25%. The average value of the Body Mass Index (BMI) was 26 ±4 and in particular 85.7% had BMI lower than 29 and 14.3% over 29. When asked if their lifestyle changed after the infraction, 67% replied positively. In a scale similar to the one used in smoking, from 1 to 12, patients were asked to evaluate the stress they felt in their daily lives. The average value of responses was 10.3 ±2.6 measuring points. The same scale was used to evaluate the doctor‟s or nurse‟s insistence on stress management. The average value of responses was 10.4 ±3 of the scale; a fact that also justifies the finding that 77.6% felt their life was threatened, contrary to 22.4% who didn‟t feel the same. The application of the one-way ANOVA analysis method was performed on nutrition, exercise, life attitude and smoking. The above parameters were compared among patients who did not suffer a new cardiovascular episode (group A), those who did suffer a new episode (group B) and those who died within the 4 years (group C). The members of group A had an average BMI of 26 ±4, group B had 26 ±5 and group C had 27±6. A healthy nutrition was followed after hospital release by 90% of group A, 78% of group B and 92% of group C, with statistically significant difference (Ρ=0.001). Mediterranean diet was preferred by 76% of group A, 73% of B and 72% of C.
The dietary score based on the special nutritional scale aforementioned was 8 ±2 for all three groups. 24% of group A considered themselves obese, in comparison with 31% of group B and 25% of group C.
Seventy six percent (76%) of group A stated that they exercised, which was also stated by 71% of group B while only 57% of group C, showing statistically significant difference (Ρ=0.001). A low percentage in all three groups selects gym as an exercise option and in particular 5%, 6% and 4% for groups A, B and C respectively. The remaining percentage of the sample studied stated that they exercise by walking or due to the nature of their work. Fifty four percent (54%) of group A and C and 46% of group B visited the cardiologist. Only 37% of group A and B and 29% of group C had blood tests performed on an annual basis. A pharmacological treatment was followed by 79% of group A, 83% of group B and 87% of group C.
Finally, a change in their lifestyle after the AMI was stated by 68% of group A, 66% of group B and 62% of group C.
Before suffering the AMI, 33% of group A, 36% of group B and 39% of group C used to smoke. All three groups stated an average of 10 cigarettes per day. This amount of cigarettes was smoked on average for 34 ±12 years by group A and B, and group C smoked the same number of cigarettes for 41 ±14 years on average. (Ρ=0.051). 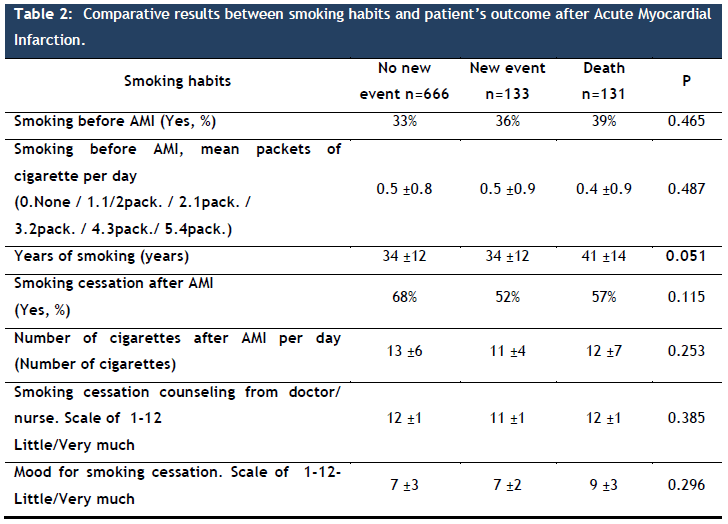 68% of group A stated that they quitted smoking after the AMI, and the same was also stated by 52% of group B and 75% of group C.
After the cardiovascular episode, the persons of group A who continued smoking stated that they had on average 13 ±6 cigarettes day; group B had 11 ±4 cigarettes and group C 12 ±7 cigarettes. We do not detect any substantial change between the quantity of cigarettes smoked before the acute myocardial infarction and after it. Based on the evaluation scale (with values ranging from 1 to 12) of the doctor‟s / nurse‟s advice to quit smoking, as aforementioned, group A evaluates on average this attempt at 12 ±1, group B at 11 ±1 and group C at 12 ±1. A respective scale, as aforementioned, was used to also evaluate willingness to quit smoking on behalf of the patients. On average, group A evaluates its willingness at 7 ±3, group B at 7 ±2 and group C at 9 ±3. Smoking reduction and quitting as well as pursuance of healthy dietary habits are protective factors for the course of patients following an acute myocardial infarction. Modern and older studies, such as the one by De Lorgeril M et al.,  published by the International Scientific Center of Lyon in France, 12 years ago in the American College of Cardiology Journal; support the protective significance of a healthy nutrition following an infraction. In particular, they conclusively suggest in their study that the Mediterranean diet has protective action against the occurrence of cardiovascular complications in patients with coronary disease. In particular it is mentioned that the dietary properties of the Mediterranean diet, such as omega-3 fatty acids, oleic acid and antioxidant vitamins have particular protective properties. The department of Clinical Nutrition of the University of Kuopio in Finland, admitting the significance of dietary habits in patients further to an infraction, performed an interesting study in which it attempted to check the degree by which dietary habits are influenced by educational levels. In this study, they included only persons who had suffered an infarction. The conclusion was that men with higher educational levels pursued healthy dietary habits with greater success, contrary to women who had difficulties achieving the same. The Clinical Pharmacology department in Santa Maria Imbaro, Italy, published a study in the European Journal of Clinical Nutrition aiming to verify whether simple dietary advice for the increase of Mediterranean food consumption, as issued in a clinical environment, led to the reduction of mortality further to a myocardial infarction. The study outcomes suggest that a healthy diet had protective effect in sub-groups determined by age, gender, smoking, randomized treatment and simultaneous therapeutic treatment. In conclusion, infarction patients may respond positively to simple dietary advice and this is expected to lead to a significant reduction of the risk of premature death, regardless of any pharmacological treatment. A clinical nurse must regularly provide advice to patients with myocardial infraction, in order for them to increase the consumption of Mediterranean food. An article of the GREECS study, titled 'Short-term prognosis of patients with acute coronary syndrome, by evaluating their physical exercise, the adoption of a Mediterranean diet and smoking habits’, suggests in its conclusions that among patients who had severe acute coronary syndrome, a healthy lifestyle seems to be correlated with less severe cardiac events and lower risk of death, 30 days after the event. An article titled The relation between following a Mediterranean diet as well as the severity and short-term prognosis of acute coronary syndromes, part of the same GREECS study, was published in the Nutrition journal. The study‟s aim was to evaluate the connection between following a Mediterranean diet and the severity and prognosis of acute coronary syndromes. In conclusion it is referred in the study that the dietary habits of the sample studied are too close to the mediterranean diet, a fact that seems to be associated with lower severity of coronary heart disease. The Community Medicine department of the Lund University in Malmo, Sweden, published a study in the Journal of Internal Medicine titled: Dietary habits following myocardial infraction. The study included patients with history of coronary disease who had suffered an infarction. The research team provided them with dietary recommendations aiming to follow healthy nutritional habits. Almost 4 years later, those who had survived the coronary disease stated they had followed dietary habits according to the original directions provided by the research team. The Public Health department of the University of Minnesota in USA performed a study aiming to check the relation between nutrition and the occurrence of coronary disease. Completing the study, they conclusively suggest that dietary habits emphasizing on nutritional food, rich in natural fiber and Ω3 and reduced saturated fatty acids, are related to reduction of the risk of myocardial infaraction. A study by the Social Medicine department of Lodzi, Poland, suggests that in addition to pharmacological treatment, nutrition and frequent physical exercise play a significant role in the secondary prevention of cardiovascular diseases. The study‟s aim was to evaluate the dietary habits and physical exercise in men with coronary disease, participating in a cardiac rehabilitation program. In conclusion they mentioned that physical exercise in men with coronary disease, improves cardiac rehabilitation. The study population failed to follow the dietary directives provided, and thus more attention is required in the dietary habits of men with coronary disease participating in cardiac rehabilitation programs. As already mentioned (table 2) smoking, and in particular, years of smoking, are aggravating factors for the occurrence of a new episode and lead to bad prognosis after an infraction, p=0.051. Many studies concur with this outcome, as shown below. A study performed and published sixteen years ago by the Medical School of the Alabama University in Birmingham, United States, aimed to verify whether the continuation of smoking or its quitting was related to long-term survival and morbidity in patients with coronary disease. The study conclusions indicatively suggested that among patients with diagnosed coronary disease, those who continued smoking had reduced survival rates – particularly those submitted to a bypass surgery. In addition, smokers had more possibilities to present relapsing pectoris angina, less physical exercise and more hospital admittances. Three years later the University of Goteborg in Sweden, announced results of the survey was designed to determine their smoking habits in consecutive patients with acute myocardial infarction and prognosis in relation to other risk indicators and the likelihood or not to quit smoking. The results of the study indicated that patients who had quit smoking after their myocardial episode reported fewer symptoms of chest pain (p <0.01), headache (p <0.01) and dizziness (p <0.001) compared to patients who continued to smoke one year after stroke. Of the patients who had quit smoking, the mortality 4 years after was 17% in relation to 31% for patients who continued to smoke (p <0.05). These results clearly demonstrate the bad results of smoking in patients with ischemic heart disease. Study of the Department of Internal Medicine and cardiovascular diseases at Mayo Clinic Rochester of United States declares in conclusion: Patients who continued to smoke after successful coronary revascularization were at higher risk for the occurrence of Q-wave myocardial infarction and were more likely to die than those who did not smoke or quit smoking. Quit smoking, either before or after revascularization was beneficial. Patients undergoing coronary artery revascularization should be encouraged by doctors and nurses to quit smoking. A study of Hartford Hospital in the United States highlights the importance of the management of risk factors in patients after myocardial infarction. After a great program control of risk factors conducted by counseling, telephone follow-up and a meeting report researchers concluded that patients who smoked before and after the heart attack and followed the program, reported significant levels of smoking cessation one year after the program. Similar programs of controlling cardiovascular risk factors or specific smoking cessation should be part of the management of patients after myocardial infarction. 20 year follow-up study of patients after myocardial infarction and coronary artery bypass (CABG) was applied by the University Hospital Dijkzigt in Rotterdam, Holland. The aim of this study was to determine the impact of mortality by smoking cessation after CABG. In conclusion, the study indicated that patients who continued to smoke after CABG had a greater risk of death than patients who quit smoking. Moreover, patients who continued to smoke were submitting in CABG more frequently than those who quit smoking or never smoked. Quit smoking is therefore recommended after myocardial infarction and CABG. Clinicians and nurses are invited to help with specific rehabilitation programs patients who smoke to quit smoking and those who did not smoke to continue this attitude after MI. Smoking, according to the study of the cardiology department of the medical faculty of the University of Rochester in the United States, appears to affect lipid levels. The study involved 1045 patients who had suffered a heart attack in the last 2 months. Patients who smoked were asked to abstain from smoking habits for 24 hours, to collect blood sample and make measurement of total cholesterol, HDL, LDL, apo-B, apo-A, triglycerides, factor VII and VIIa, factor von Willebrand, D-Dimers and fibrinogen. The statistical analysis results showed that smokers had higher levels of total cholesterol and apo-B compared to nonsmokers (p<0.01). The levels of HDL and apo-A were similar between the two groups. Many patients of the sample studied did not follow the instruction given and smoked in the last 24 hours before blood sampling. In these patients the results showed higher values apo-B, total cholesterol and fibrinogen. In conclusion, it is revealed that increased lipid levels in relation to the first measurements made after AMI is due to smoking. Smoking and risk of recurrent coronary events after myocardial infarction is the title of a study conducted by the University of Washington and cardiovascular health research unit. The conclusions of the study indicated that after the occurrence of stroke, smoking was associated with high risk for recurrent coronary events. Interesting and important is the fact that people who stopped smoking after the attack takes 3 years to have the same risk with no smokers. Another study that highlights the importance of smoking cessation after acute myocardial infarction. An interesting study conducted by the department of epidemiology and public health medicine at the University of Navarra in Pamplona, Spain and was published by the Spanish Journal in Cardiology. The purpose of this study was to evaluate the association between the risk of fatal or nonfatal cardiovascular events in patients who had previously suffered heart attacks and continue to smoke or have stopped after the episode and treated with secondary prevention measures. According to the study, the risk of recurrent myocardial infarction is three times higher in patients who continue to smoke after an acute coronary event compared to patients who quit smoking. Impressive is the fact that the risk of developing a new episode in patients who have suffered first myocardial infarction and quit smoking is similar to the risk of non smokers. Study of Hilleman et al., conducted by the Heart Center of Creighton University in the United States was designed to compare the conservative advice to quit smoking and the aggressive strategy of quitting smoking in patients who had undergone coronary artery bypass. After the study was completed, the analysis results revealed that patients followed an aggressive smoking cessation program ended up quitting smoking, compared to those who followed a conservative program after undergoing CABG. The study also indicates that more research will be needed to confirm that early smoking cessation with aggressive intervention should be offered to all smokers undergoing CABG. The department of medicine chest of The Prince Charles Hospital, Brisbane, Queensland, Australia, conducted a study entitled effectiveness of hospital-based smoking cessation. The purpose of the study was to evaluate the hospital, according to the program provided for smoking cessation and patient‟s behavior modification. The study reveals the importance of programs developed by hospitals on smoking cessation, since such a program evaluate the functioning of the hospital. Smoking cessation is a very important issue that is why more programs of smoking cessation are developed. Nursing department of Quebek University, in Canada, conducted a study investigating the effectiveness of cessation programs for patients with cardiovascular disease. The study involved 168 patients who were randomly selected. The hospital intervention consisted of 1 hour counseling session, followed up to 6 telephone calls during the first 2 months. In conclusion, it seems that this program with telephone follow-up resulted in substantial rates of smoking cessation within the first 6 months. Therefore, it is necessary to create such programs of smoking cessation and rehabilitation after cardiovascular disease. Patients who continue to smoke after a heart attack are at higher risk for death than patients who quit smoking. Quit smoking is beneficial to long-term prognosis in patients with myocardial infarction. This is the result of another research which affirms the need for smoking cessation in patients who have suffered acute myocardial infarction. The study was conducted by the medicine department of Osaka University, in Suita, Japan and was published in 2005. Greek study conducted by the cardiology department of the general hospital in Nice of Piraeus, highlights that persistent smokers after stroke are at high risk and need special attention. The study lasted three years and concluded that patients who continue to smoke after a heart attack have more negative attitude on health and do not usually follow the doctor‟s instructions. Therefore, these patients should be encouraged and supported to quit smoking. Results of the INTERHEART study conducted in 52 countries by the Institute for Health Research and the University of McMaster, in Hamilton, Canada, in 2006 revealed that smoking habit is one of the leading causes of myocardial infarction worldwide, especially among men. All forms of tobacco use, including different types of smoking, chewing tobacco and inhalation of SHS, should be discouraged by doctors and nurses through special rehabilitation programs. The research group of Toronto University in Canada investigated the relation between inhospitable smoking cessation and counseling and causes of mortality in patients with myocardial infarction. The study titled „In hospital smoking cessation – consulting and mortality causes in patients with acute myocardial infarction‟, concluded that smoking cessation counseling is an inadequate intervention, but is independent of the major cause of mortality. It is of great importance to give emphasis in smoking cessation programs in and out of hospital. A healthy nutrition characterized by the elements of Mediterranean diet and physical activity – exercise help in the positive prognosis of patients following an acute myocardial infraction. Smoking, and in particular, smoking years, are a negative prognostic index for patients with infraction.